Mention Emotional Intelligence and some people will start squirming – especially leaders and others that suspect that they might not have it! Sometimes, Emotional Intelligence is classified with ‘soft skills’, i.e. squishy stuff, but any discussion of the importance of Emotional Intelligence has to start with a common understanding of what it is. Academics and authors have created many different models of Emotional Intelligence. At the core, they all boil down to awareness and management of ourselves, our emotions, and our relationships. At the top, is awareness of both self and others. Management, of self and relationships, is at the bottom. Self-awareness is the ability to recognize our emotions, the moods that we are being governed by, and our triggers. 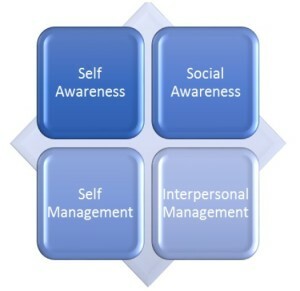 Self-awareness involves acknowledging our strengths and developmental needs as well as perceiving ourselves in a way that is positive and not unrealistic or egotistical. Self-awareness is the key that opens up everything else. Self-management is the domain of emotional expression. This involves things like motivation, impulse control, assertiveness, self-directedness, optimism, flexibility, and stress management. Comparing two people, one of which flies off the handle when he is criticized by a co-worker, and the other of which recognizes that he feels hurt by the criticism but asks questions to better understand the co-worker’s dissatisfaction, provides an apt illustration of self-management. Social Awareness is understanding the feelings of others, as well as our impact on others and how we are perceived. Empathy is a key component of social awareness. Interpersonal Management is our ability to achieve successful relationships with other people, at work, home, and in our communities. Relationships are the cornerstone of the human experience and being able to satisfactorily navigate through them, even when things don’t go our way or people disappoint us, requires all four dimensions of Emotional Intelligence. It’s not just about being nice. Sometimes, people think that being emotionally intelligent is synonymous with being nice. Indeed, as some people develop greater emotional intelligence, their enhanced understanding does lead them to be kinder to themselves and others. But someone else might become more assertive or direct in their dealings as they develop emotional intelligence. Some people, who recognize that not all emotions should be freely expressed at all times, fear that emotional intelligence will require them to wear their hearts on their sleeve. But emotional intelligence is not about constantly venting one’s feelings. Rather, by better recognizing their emotions and our triggers, people often find that they don’t find it necessary to express emotions in unproductive ways. When we work to develop greater emotional intelligence, we seek to better understand our own and others inner workings. By understanding our needs and emotions, we form a basis for managing our feelings, impulses and motivations. Better understanding others’ needs and emotions provides the platform for learning to build bridges to work more successfully and more productively with others.